Sensex has broken the level of 17300-17350 which was holding for last few sessions. 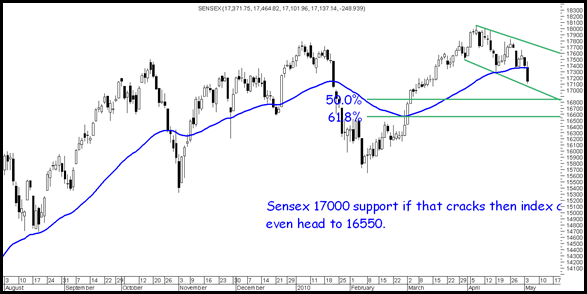 This indicates start of yet another healthy correction which could take the index to 17000/16850/16550 in near term. Till 16900 holds on closing basis we could see a sharp pullback else we would be headed to the 61/8% retracement levels. Although we did get a bounce once from 17350 to 17800 but this time around did not expect the crack to come in so quick. Market loves to surprise so one needs to keep discipline.The view to avoid leverage in the last few weeks has kept people insulated. The long term trend still remains positive and in the short term we need to start closing above 17400/17950 to see a trend reversal. So investors can continue to be stock specific and be patient. Traders should take care as volatility should increase heavily. High risk players can buy around 16900-17000 in index with a stoploss of 16840 tgt price of 17400. Tata Steel below 570 and Hindalco below 160 look interesting buys for bottom fishers. Stocks could give a quick 5-8 %bounces from the lows. Midcap Stocks continue to look attractive on declines provided one has patience. PLEASE TRY TO PROVE SOMETHING POSITIVE FROM YOUR SPECULATION. AT LEAST GIVE ONE INTRA DAY STOCK PICK . THAT WILL PROVE YOUR INTUITION RIGHT. For today had mentioned index long and Hindalco Tata Steel which did good. 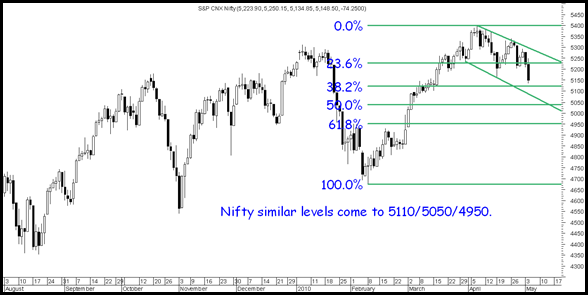 Nifty gave a good 50-80 points and others 3-4%. Don’t mind…..But suscribe the advisory services and you will get many intraday stock pick. It seems that you are a new reader on this site.